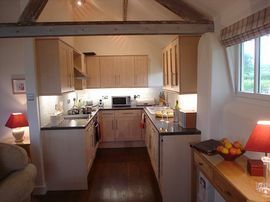 Barn conversion to two 5* cottages, in North Wales located 8 miles from Wrexham and 10 miles from Chester. 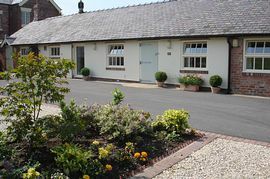 The Cottages have been sympathetically and expertly converted, and offer the finest standard in holiday accommodation, located in a peaceful rural location with open views across the surrounding countryside. 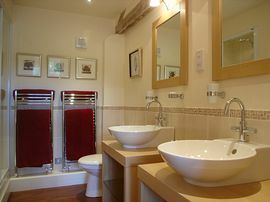 A Master double bedroom with king size bed, en-suite bathroom with bath and large walk-in shower. 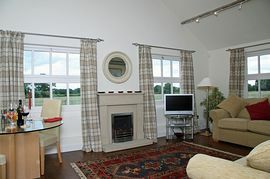 The Sitting Room with dining area contains a living flame fire in a stone fireplace, a sofa bed, LCD TV DVD and CD player. 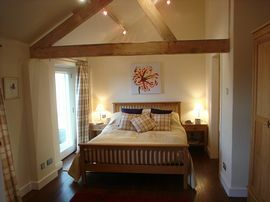 High quality oak furniture with oak floors and loose rugs throughout. The Kitchen is fully fitted with an Electric Hob, Fan Electric Oven /Grill and Microwave, Dishwasher, Fridge, Freezer, Washer/dryer machine. The cottages have a patio area, with patio furniture. Wheelchair access from tarmaced driveway. Small well behaved dogs allowed. Local Services: Local shops, bank, chemist, restaurants, wine bar 2 miles. Heading north on the A483, come off at the Rossett/Llay junction. Turn left and continue to the second sign to Burton, turn right into Croeshowell Lane. Continue to the end of the lane and turn left into Rosemary Lane. Continue to the end of the lane to the 'T' junction and turn left. Very shortly you will see a sign to Golly, turn right and continue along the lane - Golly Farm is the first property on the left hand side. Low Season: £350.00 per week. Mid Season: £420.00 per week. High Season: £490.00 per week.